Take Interstate 93S to Exit 26/Leverett Circle/Cambridge. Follow the signs towards North Station. Turn right at the end of the ramp onto Nashua Street. Turn left at Lomasney Way. TD Garden will be located on your left. Take Interstate 93S to Exit 28/Sullivan Square/Charlestown. After exiting, stay left and follow signs for Sullivan Square/Charlestown. Enter traffic circle and follow signs for Downtown/Storrow Drive. This is Route 99 South (Rutherford Ave.). At Bunker Hill Community College, follow signs for City Square/Downtown Boston. Stay straight and follow signs for North Station. Take Interstate 93S to Exit 24A/ Government Center. After exiting, stay right onto Clinton Street. Take Clinton Street to the end. Turn left onto North Street. Take to the end. Turn right onto Congress Street. Stay straight. Congress Street turns into Merrimac Street. TD Garden will be on your right. Take Interstate 95S to Route 1S. Follow Route 1 across the Tobin Bridge and follow signs for Storrow Drive/Cambridge. Stay right to exit at Nashua Street and follow signs for North Station. TD Garden will be on your left. Take Interstate 95N to Interstate 93N to Boston. Enter 93N Tunnel. Take Exit 26/Storrow Drive. After exiting, stay in the left lane and follow signs for North Station. Make a right at the next set of lights onto Nashua Street. Follow Nashua Street until the end and make a left at the lights. TD Garden will be on your left. Depending on where you plan to park for a TD Garden event, you may also consider taking Exit 23/Gov’t Center off the 93 N Tunnel. After exiting, get in the right lane. At the top of the exit, at the first traffic light, stay straight, and follow the sign for North Station. Merge into right lane. This is Cross Street. Stay to the right and go through 2 sets of traffic lights. Make a right at the third traffic light. At the fourth traffic light, fork left onto Medford Street. Take Medford Street to the end and turn left onto Causeway Street. TD Garden will be on your right. Take Mass Pike East to Interstate 93N to Boston. Enter 93 N Tunnel. Take Exit 26/Storrow Drive. After exiting, stay in the left lane and follow signs for North Station. Make a right at the next set of lights onto Nashua Street. Follow Nashua Street until the end and make a left at the lights. TD Garden will be on your left. Turn left onto Berkeley Street. At the end of Berkeley Street, turn right onto Storrow Drive East. At the end of Storrow Drive, turn right onto Martha Road/Nashua Street. Turn left onto Causeway Street. TD Garden will be on the left. Exit the airport and follow the signs to the Sumner Tunnel (Toll Tunnel) toward Boston. Once through the tunnel, stay in the right lane and take the ramp marked Storrow Dr/Cambridge. Once on the ramp, follow signs for North Station. The North Station Garage is open daily from 5:00 AM – 1:00 AM. For directions to the parking garage, navigate to the Nashua Street ramp located at 121 Nashua Street, Boston, MA 02114 or to the Causeway Street ramp located at 140 Causeway Street, Boston, MA 02114. 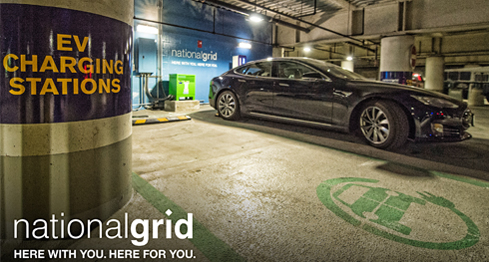 The North Station Garage is equipped with 4 National Grid EV Charging Stations. If you have an electric vehicle, navigate to the Causeway Street ramp located at 140 Causeway Street, Boston, MA, and turn right once you get to Level 1 of the garage. *Allows entry 2 and 1/2 hours prior to scheduled event start time. Daily rates apply to each 1/2 hour before that. Maximum event cost is $70.00. Event rates as posted. Cars remaining in the garage after 6:00 PM are subject to additional charges. Maximum vehicle height for North Station Garage is 6'8". We have teamed up with SpotHero, the official parking partner of TD Garden, to provide fans with additional parking options that can be reserved in advance. Select the event that you’re headed to in the window below or download the free SpotHero app to book a space at a parking location within easy walking distance of TD Garden. Once purchased, parking passes are emailed instantly. Save time and start parking smarter with SpotHero, the nationwide leader in online parking reservations!